After an eight-year hiatus, Canberra’s most-loved party bus is back. Many Canberrans will have fond memories of Craig Petroni and the Moonlight Bus, which ran for 23 years and retired in 2009. Since returning to the nation’s capital earlier this year with a new name and a new vehicle, Moonlight Stretch Limo promises to make your Christmas party, hens night, birthday or work function an event to remember. 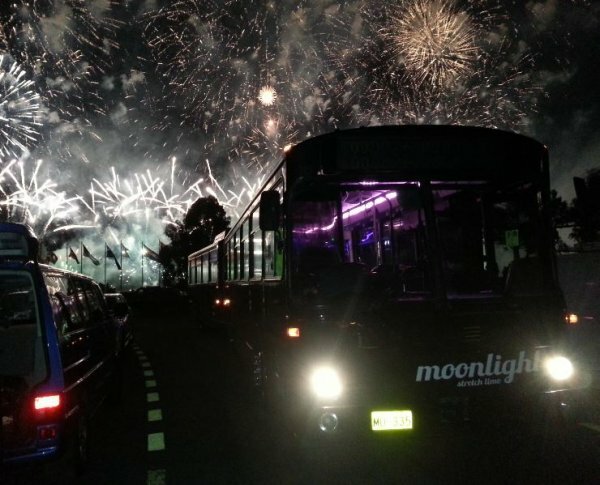 Moonlight Stretch Limo is Canberra’s only articulated bus specialising in events and tours around the ACT and region, and co-owner Pam Dean says that feedback is always positive. “From our nightclub tours, to our wedding shuttles or country pub tours, everyone and every age group love the experience,” she says. 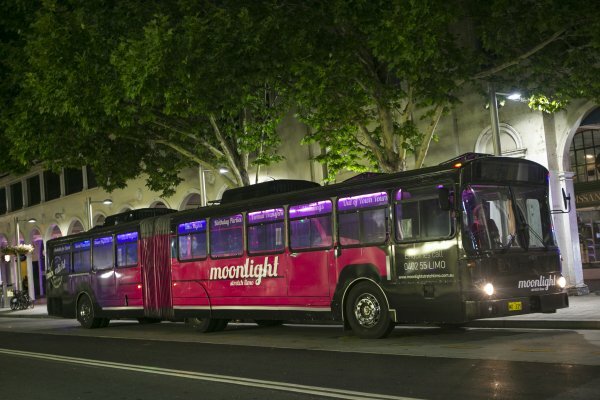 In its former life, the Moonlight Stretch Limo was an Adelaide Metro bus. It is now almost unrecognisable thanks to a black and hot pink exterior wrap job, chrome wheels, party lights and awesome sound system – a look that the owners (Pam Dean, Craig Petroni and Daryl and Tara Clarke) say “really rocks”. While Moonlight Stretch Limo is well-known for its nightclub tours, Pam says that it also offers experiences such as country trips to pubs and wineries for people who want to have a good time without hitting the town. “People want to get out of the CBD and do something different, whether that’s for a wedding, hens or bucks night, work celebration or just because they can,” she says. If you enjoy dressing up, drinking alcohol and eating good food, the Moonlight Stretch Limo team is also working with Iron Bar in Sutton to organise themed tours (Rocky Horror Picture Show, anyone?) for singles and groups. A typical Moonlight Stretch Limo experience includes a driver and two hosts. They also have an on-board esky to keep the BYO drinks icy cold. Guests can choose the music or let the hosts tailor music to suit the crowd. At $89 per head for a country pub tour and just $65 per head for a nightclub tour, it’s great value too. The Rocky Horror evening/night is happening on 13 December 2014! Check our Moonlightstretchlimo Facebook and at http://www.moonlightstretchlimo.com.au over the next couple of days for details!